This poster taped up in front of the women’s bathroom advises women on bad or dangerous dates to go to the bar and ask for Angela. That’s because Angela is the pub’s code word for patrons who feel uncomfortable or endangered. 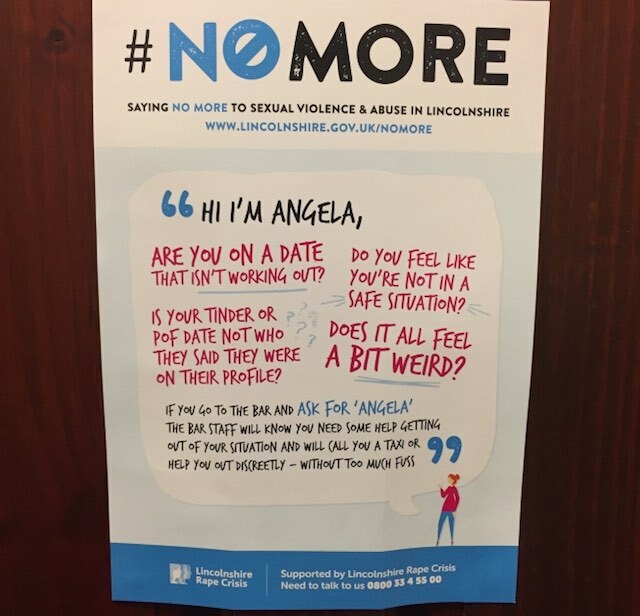 Spearheaded by the Lincolnshire City Council in Lincolnshire, England, the poster has been applauded as a clever way of making women feel safer in public spaces. The poster was created as part of the city council’s #NoMore campaign to end sexual assault. It’s been gaining traction on social media since a Twitter user published a photo of the notice to 30,000 retweets and counting.